Douglas-fir has been planted in Bavaria for over 100 years. Its high growth potential and good wood quality combined with its silvicultural characteristics have increased interest in the species which can easily be integrated into existing natural ecosystems. In order to be successful in the establishment of Douglas-fir one must select the best provenance (only the so called “green” or viridis coastal type form is suitable for Bavaria), maintain a broad genetic base and carry out proper silviculture. 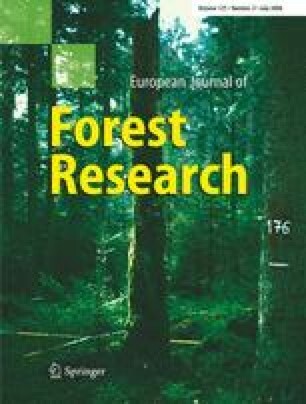 The goal of the study was to check the origin/provenance (coastal or interior type) of older Bavarian Douglas-fir stands, the respective genetic variation of the stands and also the natural regeneration, the collected seed and the plants raised in the nursery. Possible changes in the genetic composition and diversity due to selective processes in the nursery phase were also investigated. Isoenzyme gene markers were used for the study. The majority of the investigated older stands apparently belong to the coastal type Douglas-fir; however, we also found mixed stands and stands solely of the interior (unsuitable) type. Older stands show large variation in their genetic diversity (vgam between 19.9 and 90.1). Some of the stands of unsuitable provenance have natural regeneration and others have been selected as seed collecting stands. Through natural regeneration the genetic structure of the older stands is passed on to the following generation. The same is true for reproductive material collected from such stands. In comparison to seed collected from stands in the USA (from stands selected by the EU for seed collection), seed from Bavarian stands is genetically very heterogeneous in respect to the allele variants and the diversity. No significant changes in the genetic population structure were found in the nursery due to sowing or transplanting. The critical stage for obtaining high quality reproductive material of Douglas-fir is the selection of seed collecting stands and the harvesting procedure. The resulting consequences for seed collection and procurement of suitable reproductive material for Douglas-fir are discussed. The foregoing study is part of the project “Genetic aspects of natural and artificial regeneration of Douglas-fir”. We would like to thank the Bavarian State Ministry of Agriculture and Forestry for providing funding and support for these investigations.